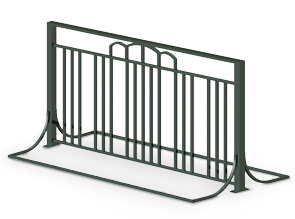 The Windsor Series Bike Rack beautifies the streets by providing an organized place for your visitors to park their bikes instead of locking them up to trees or signposts. Pre-drilled holes to mount to a flat surface such as concrete. Solid steel commercial grade construction will provide many years of service. Matching bollard bike rack, trash receptacle, and picnic table available.